Geologists have found evidence for an ancient megaflood which they say is a good match for the mythical deluge at the dawn of China's first dynasty. The legend of Emperor Yu states that he tamed the flooded Yellow River by dredging and redirecting its channels, thereby laying the foundations for the Xia dynasty and Chinese civilisation. Previously, no scientific evidence had been found for a corresponding flood. But now a Chinese-led team has placed just such an event at about 1,900BC. Writing in Science Magazine, the researchers describe a cataclysmic event in which a huge dam, dumped across the Jishi Gorge by a landslide, blocked the Yellow River for six to nine months. When the dam burst, up to 16 cubic kilometres of water inundated the lowlands downstream. The evidence for this sequence of events comes from sediments left by the dammed lake, high up the sides of Jishi Gorge, as well as deposits left kilometres downstream by the subsequent flood. Lead author Dr Wu Qinglong, from Nanjing Normal University, said he and colleagues stumbled on sediments from the ancient dam during fieldwork in 2007. "It inspired us to connect the next possible outburst flood with the abandonment of the prehistoric Lajia site 25km downstream," he told journalists in a teleconference. "But at that time we had no idea what the evidence of a catastrophic outburst flood should be." The Lajia site, famously home to the world's oldest noodles, is known as China's Pompeii; its cave dwellings and many cultural artefacts were buried by a major earthquake. "In July 2008 I suddenly realised that the so-called black sand previously revealed by archaeologists at the Lajia site could be, in fact, the deposits from our outburst flood," Dr Wu said. 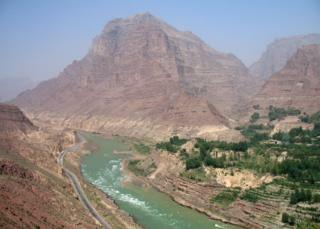 "The subsequent investigation confirmed this speculation and showed that the sediments from this outburst flood are up to 20m thick, and up to 50m higher than the Yellow River - indicating an unprecedented, devastating flood." He and his colleagues suggest in their paper that the very same earthquake that destroyed the Lajia dwellings probably dammed the river upstream. Less than a year later, the waters returned with a vengeance. "The flood was about 300-500,000 cubic metres per second," said co-author Dr Darryl Granger, from Purdue University in the US. "That's roughly equivalent to the largest flood ever measured on the Amazon river; it's among the largest known floods to have happened on Earth during the past 10,000 years." Using carbon dating - on flood deposits and even on fragments of bone from earthquake victims at Lajia - the researchers date the megaflood to 1,922BC, "plus or minus about 28 years", Dr Granger said. If the flood was indeed the source of the Emperor Yu legend then the founding of the Xia dynasty presumably occurred within a few decades, in about 1,900BC. This date is 200-300 years later than many previous estimations. But Emperor Yu's tale is difficult to pin down using traditional historical sources; the story survived as oral history for a millennium and its first known written record dates to around 1,000BC. On the other hand a later, circa 1,900 commencement for the Xia supports that idea that this first dynasty coincided with the transition from Stone Age to Bronze Age ways of living. Some archaeologists have already linked the Xia dynasty with the Erlitou culture, an early Bronze Age society known from digs elsewhere in the Yellow River valley. Dr David Cohen from National Taiwan University, another co-author, said the study was remarkable because of the multiple lines of evidence involved. "We have the geological evidence of just a huge outburst flood, which is incredible in itself," he said. "But then there's this coincidence of it co-occurring with the destruction of the Lajia site - which is able to give us very, very precise dates… and then that this flood was of such a scale and corresponds in time, and along the Yellow River, with both the beginnings of Bronze Age civilisation and the legend of the great flood itself. "It's just this amazing story. All these different approaches coming together - it is just great luck." Prof David Montgomery of the University of Washington is a geomorphologist with an interest in what rocks can tell us about ancient myths and legends. He was not involved in the research but wrote a commentary for the journal and discussed the findings on the BBC World Service programme Science in Action. Among the world's various flood myths, Prof Montgomery said, Emperor Yu's story is an odd one. "It's not about surviving. His basic story is about draining the flood waters; it's about river engineering." The case made for the Jishi Gorge megaflood is a plausible one, he said, particularly because it describes a flood that would have broken the Yellow River's banks far downstream and re-routed its flow. Prof Montgomery said this is just the sort of event that would take decades to deal with - and a long battle with the waters is a feature of the Yu myth. "It's very difficult to ever actually prove the origin of pre-written history events. But they've made a very interesting case, that I'm sure geologists will continue to poke at, and investigate, and argue about - because that's what we do." At a purely geological level, he added, the flood is a major and intriguing discovery. "But the cultural connection - possibly explaining the origin of the Chinese flood story - is too intriguing to ignore."